The concept of blending traditional instruments and sounds with modern musical genres isn’t a new concept; one need only look at examples like the Yoshida Brothers rocking out on shamisen to see it done well. Wagakki Band takes that musical fusion to a new level through its sheer size: a group of 8 musicians including shigin singer Yuuko Suzuhana, Machiya on guitar, Beni Ninagawa on shamisen, Kiyoshi Ibukuro working the koto, Asa on bass, the energetic Daisuke Kaminaga playing the shakuhachi (Japanese recorder/flute), and Wasabi and Kurona on drums. Their hopes, spelled out during their press conference, was to connect with audiences across different cultures. Lofty sentiments to be sure, but the Wagakki Band is capable of delivering upon that promise. In the course of doing some pre-concert research on the band, I came across their video for “Senbonzakura”. Wagakki Band takes the Vocaloid source material, gives it a rock backdrop, and sends it off with Yuuko Suzuhana’s vocals. The song itself is enjoyable and the band’s manic energy goes a long way to showcase their passion for their medium. That video set my expectations for the Wagakki Band concert at Anime Expo where I hoped their energy would be channeled towards the audiences in a feast for the senses. And in the end, I managed to satiate one of those senses. The other one left much to be desired. So let me say this: the visual component of the concert was dazzling. Wagakki Band came to play and their enthusiasm and passion was evident in the way they showcased their individual talents on their respective instruments. While Machiya and Asa’s rocking out on guitar and bass, respectively, was standard fare as far as rock performances go, I was most fascinated by Daisuke Kaminaga, whose movement was completely unorthodox for his instrument, the shakuhachi, a Japanese recorder-like instrument. In the course of playing the shakuhachi, Kaminaga bobbed and weaved and hopped from one platform to the next, bringing much exuberance to such a seemingly modest instrument. As the concert went on, all of the members spotlighted their abilities. Their constant movement from one side of the stage to the other helped draw the audience in and made for a visually pleasing treat. The sound, however, was a completely different beast. For want of a sound engineer, the concert was lost. It’s not something that I say lightly. From the start, the band exhibited great potential, opening with their tried and true “Senbonzakura”. This rousing entry wasn’t a perfect recreation of the music video seen above (understandably), but it demonstrated Yuuko Suzuhana’s adroitness at navigating the lyrics as well as the individual members’ flair with their respective instruments. 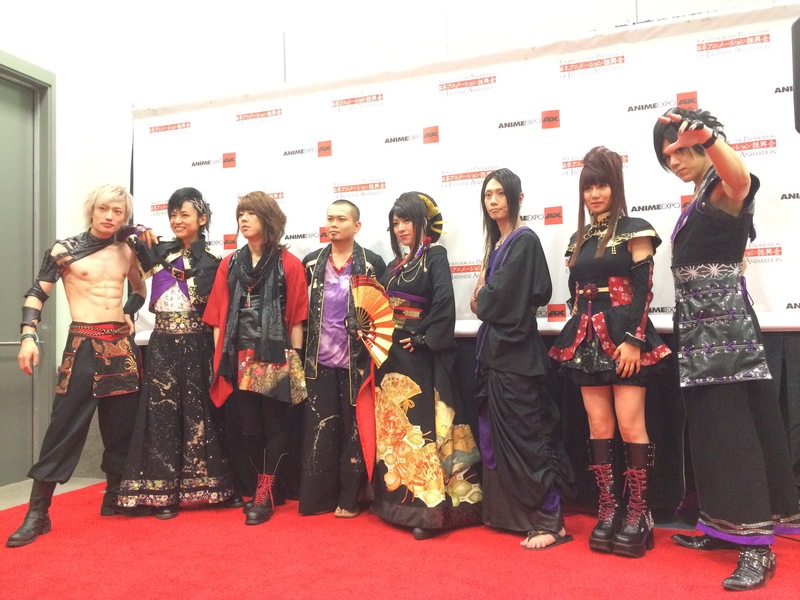 What Wagakki Band could not do was turn that individual flair into a cohesive performance. As I noted above, the primary issue was the lack of a sound engineer who could control the balance of sound coming from each instrument. The result was a guitar and bass part that was just too loud, eclipsing the softer koto parts and Yuuko Suzuhana’s more delicate passages. As much as I enjoyed watching the band perform, listening to the music live was exhausting. The wall of sound erupting from the speakers slammed my eardrums repeatedly and gradually wore me out. Surely not the audience effect these passionate musicians were looking for! That’s not to say there weren’t awesome musical moments scattered here and there. Yuuko Suzuhana was a bright spot throughout the concert. Her performance of “Senbonzakura” was expressive in her more traditional intonations, but she was able to handle the J-pop requirements for songs like “Ikusa” with relative ease. Further in, Michiya strutted his stuff with a performance of the “Stars Spangled Banner” (appropriate, since the concert took place on the 4th of July), but the best part of the concert, by far, was during the percussion duet involving Wasabi on drums and Kurona on wadaiko. Kurona packed a lot of flair and owned the stage during that segment. He led with a drum pattern that Wasabi would then imitate for a few measures. The two would then bang out a rhythm in unison and the display was riveting because of how intense it was. Not content to just fire off pattern after pattern, Kurona also reached out towards the audience, getting them involved in a call and response routine that was engaging and delightful. But beyond that, the sound overwhelmed the visuals and I was exhausted by the end rather than energized and inspired by the performance. All in all, this was a bit of a shame. The visuals kept my attention and the music would have been so much better had a sound engineer been present to balance the volume just enough such that each performer can show off their musical strengths. What we ended up with, unfortunately was a band whose members sounded far better individually than as a group. I love Wagakki Band! What you said about them bringing visuals and energy through blending modern and traditional elements of music is one I wholeheartedly agree with. But too bad your live experience for the band seems more frustrating than fun, lol. Yeah, it was pretty frustrating. Moreso because when you watched them, you see that the potential is there for them to deliver a fantastic concert. Sound issues made it unbearable, especially if you want to be able to hear some of the quieter instruments.